IPhone gains eat into Android dominance. Can it last? The Android (s GOOG) smartphone onslaught may have hit its peak, at least in the U.S., according to an analyst who thinks the expanded rollout of the iPhone (s AAPL) to other carriers will check the rise of Google’s mobile OS. Charlie Wolf of Needham & Co. pointed out that Android’s market share of smartphone sales in the U.S. fell to 49.5 percent from 52.4 percent in the first quarter, its first loss in any region in the world. Wolf believes this is the beginning of more market share losses for Android, which began with the introduction of the iPhone on Verizon(s VZ), and will continue with the release later this year of the next iPhone on Verizon and AT&T(s t), and perhaps other carriers such as Sprint (s S) and T-Mobile. Apple’s share of sales during the first quarter grew to 29.5 percent, up from 17.2 percent in the previous quarter. This tracks with a previous NPD report that found that Android sales in the first quarter fell to 50 percent of total, down three points from the previous quarter, while iOS grew by 9 percentage points for 28 percent of smartphone unit sales. It’s reasonable to assume that a material percentage of Verizon subscribers who plan to switch were content to wait until the iPhone 5 arrived later this year. One reason Apple delayed the launch of iPhone 5 until September is that it reportedly plans to coordinate the launch of the GSM and CDMA versions of the phone. To do so in June would likely have upset Verizon subscribers who purchased iPhone 4 in the preceding months. It’s our expectation, then, that the anticipated surge in iPhone sales on the Verizon network is likely to occur this fall after Apple launches iPhone 5. Will Apple continue to slowly win back Android market share, though? I think it’s safe to say that getting the iPhone out to all carriers will boost iOS market share and Android may take a hit for a while if Apple can expand to all four national operators. That’s been one of the big limiting factors for Apple and removing that will allow it to compete on more equal footing. But there’s still a lot up in the air right now, especially as smartphones turn from an early adopter device to a mainstream tool that is poised to outsell traditional feature phones this year. We’re getting into a place where less savvy and more price conscious consumers are taking the plunge. Many will choose an iPhone, but there’s still plenty of growth opportunity for Android to hit lower price points and appeal with a wide array of design choices. If Apple continues to put out just one phone a year at just a couple of basic prices, it won’t be able to keep grabbing share back from Android. Apple understands this and has seemed to indicate it plans on releasing cheaper iPhones, that are “not just for the rich.” That’s going to be key for Apple in the market share battle, especially as the Mac maker pursues other markets overseas. Assuming Apple does release some cheaper phones and continues to expand carrier distribution deals, we should see Android and iOS settle into some more stable market share positions long-term. But as I’ve said before, it’s still early in this game. Android’s share might fluctuate over time, and Apple may close the gap. But the real story is that these two platforms are very much driving the market, while the rest of the industry plays catch-up. “think Google will not work to combat the price issue” — Google controls nothing but the “free” part. What in the world can they do for pricing? Especially when Apple has the volume and the discounts and the margins to move whatever way they want or deem fit. Apple isn’t playing a market share game. It doesn’t matter to Apple whether or not Android gets 50% of the market or 70% or 30% of the market. What matters to Apple is winning the slice of the market which will return 30-40% margins in return for a high quality product offering a high quality user experience. Apple cares about making money, not putting crap into as many hands as possible. On the other side, it’s absolutely critical for Google – They make nothing unless there’s lots of ads being served on phones & they don’t care if the handsets are crap as long as there’s lots of them. Remember, revenue-wise, Google’s a one trick pony. Good point. I bet most people don’t even know they are using Android. They know they have a Samsung or a Motorola for sure. And I bet 90% of them didn’t think about whether they should get Android or not when they were shopping for a phone. They just wanted a cheap phone where they could surf the web, get email, etc. And there’s nothing wrong with that, but there’s not much to be boast about either, Android lovers, and no momentum or brand loyalty being built up. It’s similar to Windows computers, and we see how well they are doing these days. I remember in the 90’s, you’d ask people what kind of computer they had (it had to be either Mac or Windows) and a common response was, “I don’t know, I use Explorer.” unless, of course, they used a Mac and knew right away what kind and brand of computer they were using. I always “felt” that this is a case. No one ever waited in line outside a shop for an Android phone. The biggest challenge apple generally faces is cranking up its production capability which is less than the sales its products have. So it cant expand to four carriers.And since t mobile is likely to merge with att anyway,leaving out just one carrier sprint wont do much harm to apple. Also this is only a minor blip to android because more and more phones are getting updated to 2.2 from 2.1 which is reducing the fragmentation issue of android.And in few months most android phones will feature 2.3 leading to a unified experience for all androiders. Android is far ahead of apple. Apple products is just for fashion. Hope this trend wont come out as predicted. clearly the numbers have been mixed up, the analyst was probably in a rush because he thought he had a “story”. but lets say it is true, Android rise has to slow or fluctuate at some point. what matters is that higher marketshare is higher marketshare. the only time higher marketshare isnt as relevant is when your on a tailspin downwards like RIM & Nokia. yes Android is the worldwide platform of the future, no it will never have Windows like dominance. Marketshare only matters if it’s “profitable” marketshare. Android was on every carrier and Apple was just on ATT. That was until a few months ago. Now people get the chance to choose. Most will go for the quality, intuitive and safe product. It was just a matter of time. Price is not too different if you factor it in 18 months of use. Apple was on MORE carriers worldwide for quite awhile when Android was just beginning to launch & pick up steam. I realize arguing with a pure AppleFan is as futile as arguing with a Republican. but if you want to look at just numbers then you have to look at all of them, not just some recent blip on the radar that you hope will give your preferred platform a chance against the new #1 platform. Just a very personal and uneducated opinion – something ain’t looking right there to me. And some other sites question it as well. In any case, its very interesting if someone can verify it eventually. I am surprised. I thoug that android would have more growth in it, so I am surprised by these numbers. But after reading some of the comments here about the one real factor of cheaper android phones, maybe it is a case where people are not satisfied wit what they are getting and prefer to go with iPhone. I wrote about this recently. If my experience with Android is relevant, Google had better line up the vendors to understand mobile as a platform. I believe that the global user experience is much more critical to mobile than on the desktop. Android is not bad, but the fragmentation can make for a truly crappy interaction. When I purchased the Dell Streak as a testing device, I was waiting for the software upgrades to keep up with the decent hardware. Nope. I still get emails from the support threads asking about upgrades, processes, and software compatibility. As if I have such problems on my iPhone. I am looking for another Android device to run Processing on, and the options arenâ€™t creating any joy! Users rapidly gain mobile experience, and come to understand what they are going to use their device for. They see Hipstamatic and want the app. The see how Facebook works on iOS. When their contract is up, watch out. We are beginning to see the 2 year contracts expiring. If the numbers continue, there will be trouble. Before the iPhone, phones were a one-shot deal. You bought a phone that had certain features and that was never going to change. If you wanted different software or capabilities you got a different phone. They were treated as disposable and you used it until it broke, you lost it, or the contract was up. Apple was really the first to treat the phone as a proper device with upgrades and additional feature sets. Unfortunately, all the Android manufacturers still treat their phones the same way as they always have. You can be pretty sure that once you’ve bought the phone and it’s gone through it’s “new kid” cycle you can be sure the manufacturer will have abandoned it in every way. With new Android phones coming rapid-fire from just about every manufacturer, you can be sure that the phone you buy today will continue to be that exact phone for its lifespan. The manufacturer will be releasing a newer, better model in a few weeks and won’t think again about the model you bought. 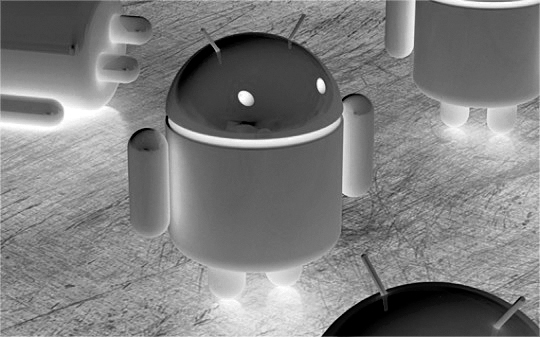 With android, there are too many competing and conflicting interests. PD hits some of them with the manufacturers but the carriers and Google have theirs too. Only Google would benefit from android as a platform I would think. Something is VERY wrong with that chart. 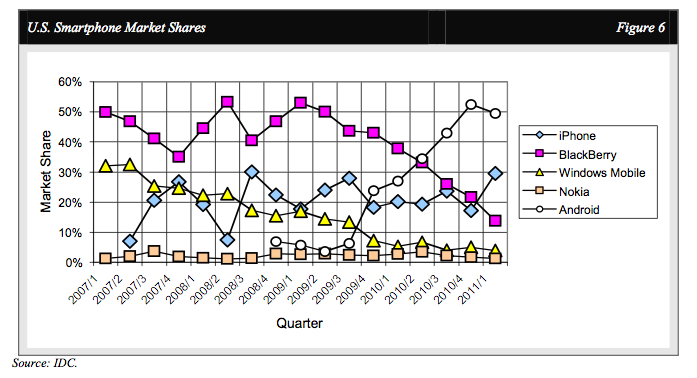 There’s NO way iPhone had ~17% market share in USA in Q4 2010. Apple had 28% in new sales, and Android had ~50%. I think he may have mixed the global data with the US one..and also mixed the *new sales* with *total sales*. UGh. If I’m right that’s a major screw up from that analyst. Ryan, can you look into that and update the article if I’m right? I’ll try to find the data, too. I really don’t remember Apple having that little last quarter. They had about 25.5% for total subscribers, and 28% for new ones, while Android had like 35% or so for total, and about 50% for new ones. This is in USA – and that US chart you have there doesn’t show that. In the global market, yes, Apple had about 17% in both new sales and total ones. So did he mix up the numbers?? I have had both. I love the personal creative touch Android phones have, almost like having a name badge or name tag in your pocket, everyone knows its yours. There are so many Iphones out there, but I still prefer the Iphone. The next iPhone supposedly won’t be 4G, so I suspect that it won’t skew the Android dominance in the smartphone market for more than a few weeks. People don’t have to settle for a fake iPhone on Verizon anymore and soon on other carriers. Plus bloatware, poor build quality, poor service and support, lousy app quality and selection, fragmentation, and tons of malware are also contributors. Android is just a terrible user experience unless you root and use custom roms and even then you still deal with all the other issues. Its only remaining virtue is cost which is a big deal as long as you are ok with you being the product Google and their device manufacturers are selling. It all depends on how you define “terrible user experience”. I think Apple trying to control every ounce of what I want or don’t want, basically renders a terrible user experience as well. Now there is talk of Apple controlling when and where their consumers can take pictures? I don’t consider this a great experience. All the quality in the world does not offeset what most of us desire. And 90% of “consumers” could care less about that control – It doesn’t affect their expectations or user experience – It just works. Yes, that’s why iOS 5 is copying a 3 year-old from Android (the Notification Center, Woooooo fancy name!). But I am sure Apple lovers will somehow believe that Apple’s version is either original, better, or both. Actually, it’s probably more likely that most iPhone users will see this feature on their friends’ Android phones and cry: “Copycat!” and gain deeper belief in the superiority of iPhone. As I recall, and Wikipedia confirms, Android was envisioned as a Blackberry knockoff (copycat). Then Apple showed them the light and the great minds at Google saw a new vision and copied that. Can we get a link to the raw report by IDC? I’m not sure how legit that analyst’s report is, but it seems entirely plausible that Apple will significantly close the gap with access to the new vast pool of potential customers. That said, I just don’t see how the long term picture for mobile bodes any differently than current picture for desktop computing. Apple will be the premiere manufacturer for mobile, but will remain relatively modest compared to the sum of all Android devices. Well they didn’t make the numbers up out of thin air. Well they didn’t make the numbers up out of thin air. There is no relationship between desktop and mobile computing market share. The dynamics and players are apples and oranges difference. The PC market of old has no relevance today as far as I can see — Back when, computing was “business” computing (very few hobbyists and no consumers) and IBM “was” business computing. When they intro’d their PC (and then the clones), the battle was essentially over, the PC was going to be it. Even when the Mac was introduced, it was over and the Mac was going to be a niche. IT controlled 90% of the purchases. Mac pricing, licensing, etc had very little effect. Fast forward to today and there is a big consumer market and they decide. Yes, some will be price sensitive but Apple’s already offering the 3GS on AT&T for $49. If they continue with this approach, they already have cheaper models. Or, since Apple’s in the catbird seat on supply chain (volume orders), they have a lot more flexibility than the individual android manufacturers. When iPhone is sitting next to an android – as they are now at Verizon – the Apple marketing, ecosystem, build quality is what will be the deciding factors and that doesn’t boade well for android. ie: In common English, Mr. Wolfe owns stock in Apple. Not that this would ever influence his analysis. Heaven forfend. As I’ve implied, it all sounds kinda iffy to me. Best to be skeptical when reading this stuff.